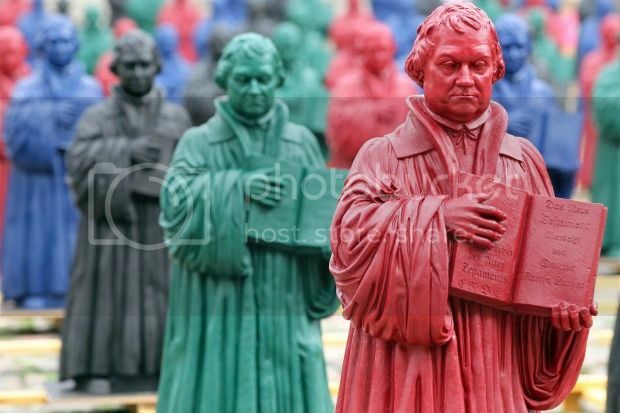 Plass: IN MATTERS of worship, as in all else, the Word of God is determinative, Luther is quoted as having commented on Isaiah 10:10-11. There is an amazing confusion of religions and forms of religious worship in the world. This came about because all wanted to have and worship a god but proceeded without the Word of God, according to the opinion of their own heart. But this is, properly speaking, idolatry, when we ourselves give God a form and invest God with some sort of religious worship (cultu) which He Himself has not instituted and has not commanded in His Word. For God does not want to be worshiped in any other way than that which He Himself prescribed. Therefore those who try to worship Him in a different way depart from the true God and worship an idol of their heart. Plass: BUT DO NOT millions of such folk mean well? The Doctor replies in his exposition of John 3:34 (August 30, 1539). For this reason it is imperative that we neither speak nor hear anything but the Word of God. Avoid whatever had its origin in man's mind and zeal. The Word of God does not come unless it is sent from heaven. Anyone associating with the monks should inquire of them whether their system is also the Word of God. You will hear them allege that it stemmed from good intentions and that its purpose is to honor God. From this they conclude that it is a worship of God and that it is the Word of God. But for anyone to worship God aright and to atone for sin, more is necessary than good intentions! All that flows from your heart is zeal and your own opinion. Tell me whether God sent it from heaven and whether He commanded it. But, they will reply, it was all done to glorify God! All the worse; it is twofold blasphemy that you call the Word of God and the worship of God which you yourself have fabricated. That is the way the pope deceived the world as he hid under the name and title of the church.